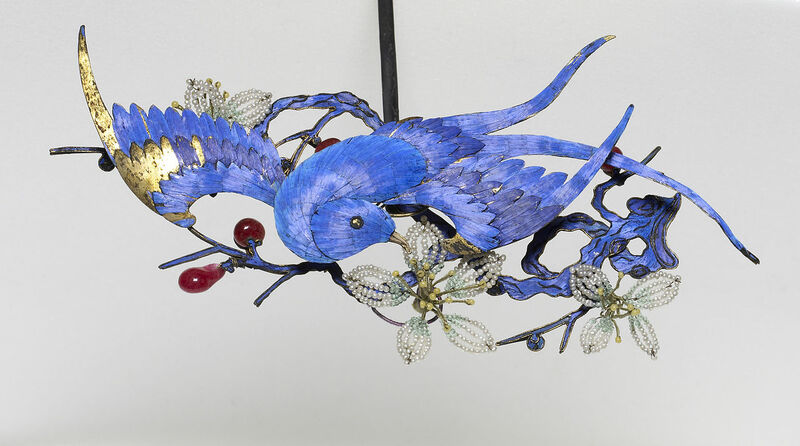 Hair Ornament, China, Walters Art Gallery. The Trump administration has upped proposed retaliatory tariffs on Chinese artworks, antiques, and historical and archaeological materials to 25%. U.S. museums, collectors, and art dealers fear that this will severely disadvantage them in the world market and deplete available materials for future museum donation. For the last 90 years, there have been no customs duties on art, antiques or books imported into the U.S. It was considered in the public interest and the interest of peace to bring art and literature to the U.S. This is one of the more bizarre stories in the Trump administration’s tariff saga, since a tariff on antiques will please the Chinese government and reinforce its global dominance and monopoly on Chinese art. Ordinarily, it is considered in the public interest to bring art and literature to the U.S., so in the past, no duties were imposed on foreign art or books. 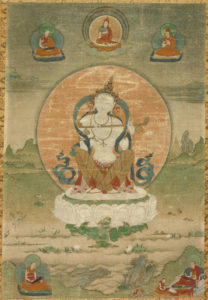 Goddess Sarasvati, Eastern Tibet, Kham region, 18th century, Mineral pigments and gold on cotton cloth, Heeramaneck Collection. The Trump administration is changing that, at least for art and antiques from China. This is one of the more bizarre stories in the tariff saga, since a tariff on antiques will please the Chinese government and reinforce its global dominance and monopoly on Chinese art. 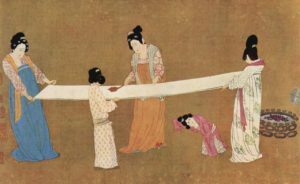 Artworks, antiques, and historical and archaeological collections are included in the Trump administration’s proposed 25% retaliatory tariff on an additional $200 billion of China imports. (Initially, proposed tariffs were set at 15%.) The Office of the United States Trade Representative (USTR) requested comments on the proposed list. CCP and other organizations submitted written and verbal testimony, links to which are below. The Office of the United States Trade Representative (USTR) is a federal agency directly under the Executive Office. It recommends U.S. trade policy to the President and conducts trade negotiations with foreign nations. However, it is clear that the proposed tariff on Chinese art only punishes U.S. collectors, dealers, and art museums – not the Chinese, who requested import restrictions on art and antiques up to 1912 in the first place! The U.S. art trade has been subject to import restrictions amounting to a ban on Chinese antiquities since 2009. U.S. art community representatives asked the administration not to renew these restrictions just last May, in testimony submitted to the Cultural Property Advisory Committee to the President. The dealers’ primary arguments against extending restrictions on Chinese art imports are based on the harm done to the U.S. museum and public interest in access to Chinese art and culture, and the harm to hundreds of American small businesses. In fact, opponents of trade restrictions argued in May that China’s violation of U.S. intellectual property rights and the counterfeiting of U.S. coins in China were in flagrant violation of U.S. currency regulations. These were both important reasons NOT to impose import restrictions that benefited Chinese businesses and harmed U.S. ones. 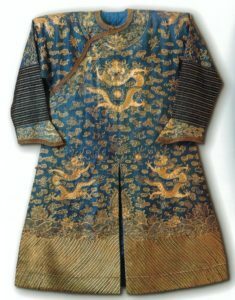 Chinese summer court robe, c. 1890s, silk gauze couched in gold thread, East-West Center. In addition, import restrictions are based upon a U.S. law, the Cultural Property Implementation Act, which sets criteria that each requesting country must meet. 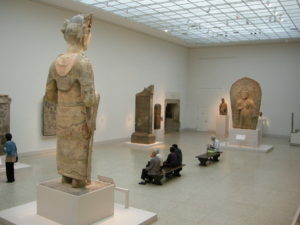 These criteria include that the objects being restricted are at current risk of looting, that the requesting country is doing its best to “protect” such objects and sites, that other countries with significant trade have imposed similar restrictions, and that the public interest in the circulation of art is served by the restrictions. Opponents of import restrictions pointed out that China does not meet the Congressional criteria for import restrictions under the Cultural Property Implementation Act. Since Chinese collectors dominate the world market, China itself has the largest market in the world for Chinese art. China is building dozens of museums each year, and auction houses affiliated with the Chinese government dominate the worldwide auction market in Chinese art. The supplemental action proposed by the bill affects all the goods in the linked Annex to the Harmonized Tariff Schedule of the United State (HTSUS). These include everything from frog legs to rubber gloves. Working artists should also note that artists’ supplies, including paint, ink, and all manner of photography and cinematic supplies, are also included in the list of goods to which the new tariff will apply. Note: Importers should also be aware of new requirements for customs entry of antiquities and ethnographic art.